At the Valentine party we had today, we learned that it was our little friend Silas' first birthday. And so we celebrated with a cupcake with a candle. I have a Zambian friend here who just had a baby. 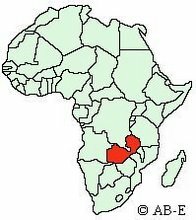 I was privileged to be able to help her a bit during this time and I thought her experience would be helpful and interesting to you as you realize some of the cultural differences surrounding childbirth here in Zambia. So, my friend, Given, was given two different due dates. One was in February, and one was in March. She really had no idea which was more accurate. So, as the month of February began I decided that I would like for Given to have a phone, so that in the event that she were to go into labor she could call me and I could help her to the clinic, or help with her other daughter. (Given is a single mom.) Thankfully, I gave her the phone when I did because she used it about 3 days later to call me and say that she was experiencing some bleeding. She had gone to the clinic and they had sent her home. The next day she called me to say that her waters had broken. I told her that she MUST go to the clinic right away, even though she was not yet experiencing any contractions. She was hesitant to go to the clinic like I was telling her because she was not yet READY! When I asked her what she meant, she told me that there were many supplies that she was required to bring with her that she had not yet purchased for the delivery. Given was distressed that she didn't have all of these things for the delivery and so I told her that Miriam (my house helper) and I would leave right away and would go and get her what she needed and that we would meet her at the clinic. Miriam and I went to the local grocery store and bought a bucket and some food and clean water for Given. (Here you supply your own food when you are in the hospital. Or, your family provides it for you, but in Given's case we were her family.) We then went to the pharmacy or "chemist" as it is called here and bought 4 pairs of surgical gloves and several umbilical cord clamps since the chemist said it was good to have more than one in case one is defective. We arrived at the clinic in Ng'ombe compound only to find that Given wasn't there yet. When we called she was just leaving her place because she wanted to get some washing done before she left. We waited for her for about 30 minutes until she finally showed up. I would've offered to pick her up, only I had never been to her house, she always came to my house. She was seen fairly quickly by the nurses at the clinic, and they immediately told her that she needed to go to UTH (University Teaching Hospital, the main public hospital in Lusaka) because there were no doctors there who could handle her case. This obviously upset Given, who was bravely crying in the backseat as I drove her to her place to gather her belonging for her trip to the hospital. She already had a suitcase packed with all the precious clothes and blankets I had given her a few days earlier not knowing she would be needing them right away. We drove to the hospital, and checked her in. She was taken upstairs and was asked if she had any cotton wool. (Cotton wool is used to absorb a lot of the fluids present....) She told the nurse that she didn't have any cotton wool because she had needed to use it because her waters had broken already. They told her that they couldn't help her until she had some cotton wool. So, Miriam and I got into the car and started to drive to find another chemist. (The hospital pharmacy was closed because it was the lunch hour.) We found the chemist, bought the cotton wool, and headed back. Miriam went back inside with the cotton wool. Anyway, to finish the story, she was in the hospital all that night, all the next day, and finally had the baby the next night. Crazy!!! She had a little boy and I asked her what his name was and she said, "I want you to name him." I laughed and said, "no, that's okay," but I later realized that she was serious. So, I told Steve that he should help me and he came up with Solomon or Silas. We gave her the choice, and she chose Silas. I started this blog a year ago and am just finishing it today.....because Silas just had his first birthday today. Praise God that he is one of the small percentage of babies that make it through their first months in Zambia. As you can see he is a healthy boy!! Hello to you! I met you all in July 2009, when I and my husband Wil visited Zambia with James and Megan Williamson. Thank you for sharing this story! It is almost unbelievable!